He said that his critics "always push him to do better." 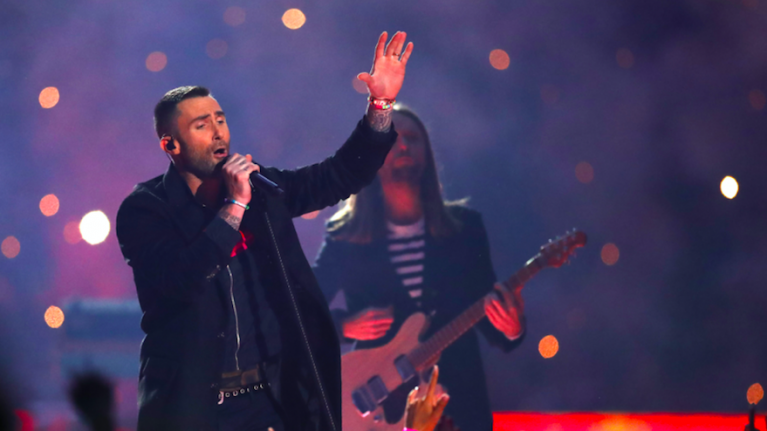 Maroon 5 drew heavy criticism overnight Sunday for putting on a Super Bowl LIII halftime show as bad as the game itself. In fact, in the aftermath of the show critics have mulled over whether the band's set is the worst performance in the American football game's history. But despite the online backlash from fans who would have rather heard a rendition of Spongebob Squarepants' 'Sweet Victory' than a set featuring cameos from Travis Scott and Outkast's Big Boi, it appears the band were relatively pleased with themselves after getting off stage. "When we accepted the responsibility to perform at the SBHTS, I took out my pen and just wrote. Some of the words that came to me in that moment eventually made their way onto the incredible lanterns that flew high and low tonight. "We thank the universe for this historic opportunity to play on the world’s biggest stage. We thank our fans for making our dreams possible. And we thank our critics for always pushing us to do better. One Love." He then shared the list of words, which can be read above.